You explore the underworld, realm of the supernaturals. Tagging along with Royal Blood vampire and his friends who fight for their life as they are hunted by people who want to cleanse the world of creatures of darkness. This guide will tackle the basic elements and strategies of the game which will help get you started. 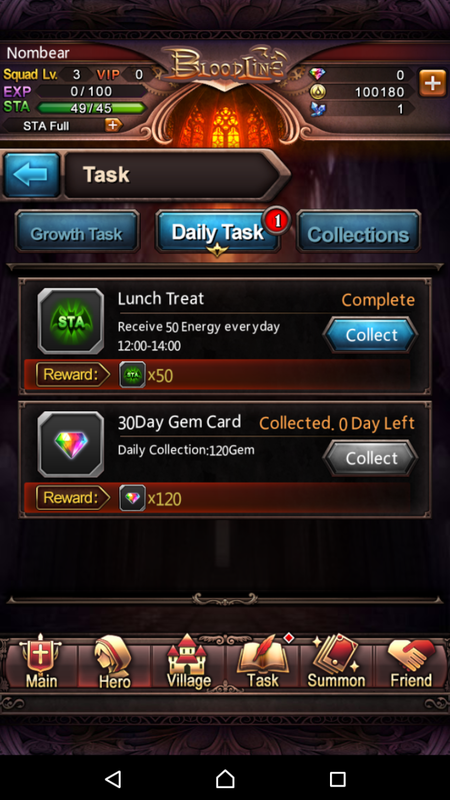 There are a lot of ways to obtain a summon, one is the normal draw where you spend x amount of gem for 1 summon or x amount of gem for a 10+1 summon where you a higher chance to get a 5 star summon. This is most advisable draw for casual players. 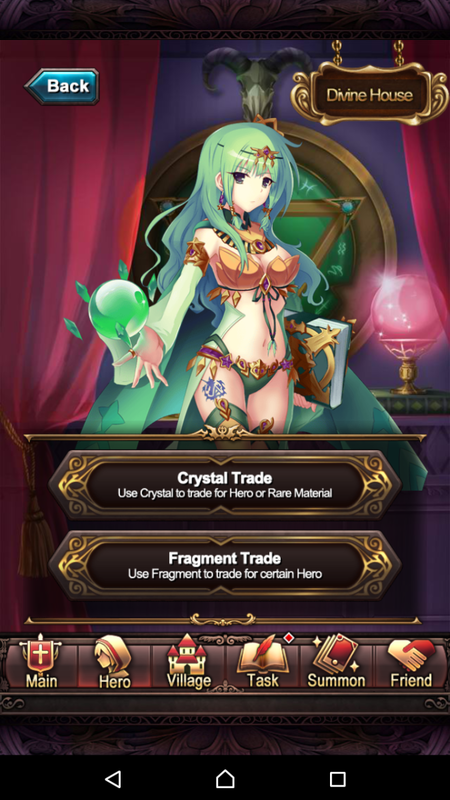 Another way is via fragments where you need to gather a certain amount of fragments and combine to acquire the specific summon. Third is via quest, stage raid or story progression; most of the stage drops summon up to 4 star depending on how far you have progressed to the story. Fourth is via the event dungeon but the loot depends on what kind of event it is and what loot does the event provide, but most loot are summon fragments too. Summons are your minions who accompany your main characters in your quest, dungeon and pvp. Summons and your main heroes can be leveled up by either doing story progress, raids, grinding completed stages or just combining your elemental slime summons with your active summons. 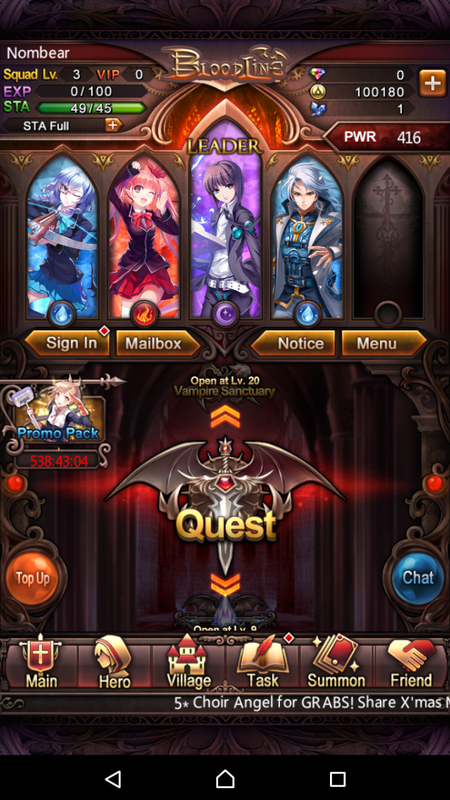 It is advisable though to progress the story because when you complete a stage for the first time, you’ll be rewarded with bonus squad exp making it easier and faster for your active party to level up. Keep those slime summons for newly acquired summons that you might want to add to your current line up. Elemental elves on the other hand are used for summon evolutions so keep those for future use. 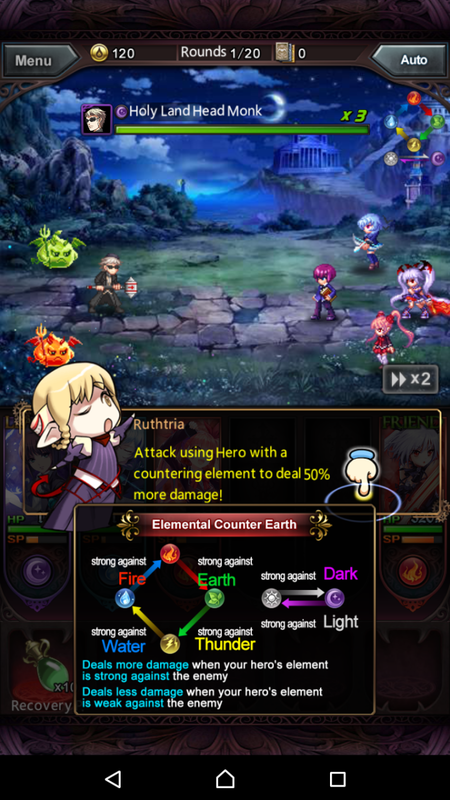 Fusion on the other hand is useful for having a newly acquired hero/ summon catch up to rest of your veteran heroes without the pain of grinding it alone, when fusing an exp mushroom or slime, make sure to use the same element so you can get an exp bonus multiplier. All hero and summon have their own unique ability which you or your friends can benefit with when either used for evolving, fusion or making it as your party leader. Your Hero/ Summon comes with their own weapon and armor equipped already, it is recommended that you Level Up those gears as soon as you can since this can really boost your Hero/ Summons’ attack power and defense in the early stage. Heroes can gain a Job Class which affects their attributes and how the attribute bonus is assigned to each class rank and level. Priests : Gains 7 Fury at the end of each round. Heroes also gain 2nd job class based on the basic job class taken. Warriors become War God or Life Drinker, Assassins can become Shadow Dancer, Ghost Blade, Ninja or Soul Addict, Archers can become a successful Arrow Master or Scout, Sorcerers can become a Warlock or a Mage, and Priests can take the path of Divine Messenger, Archon or a Martial Arts Mistress. Other hidden jobs can also be unlocked while progressing deeper through the world of Bloodline. To further maximize your Hero/ Summon, you need to evolve it to gain a higher level cap, limit break and boost on attributes. You can evolve your Hero/ Summon by reaching its current level cap and getting the materials needed for the evolution. Most of the materials can be acquired by completing a stage and from another Hero/ Summon of the same kind. Organizing the line-up for your party is a little bit frustrating at first since you’re stuck with a limited number of summons at your disposal. The fun part begins when after the 4 or 5 star summons or after you’ve evolved your main Hero to 3 stars and above. When picking a party group, do keep in mind that this game has an elemental cycle and that it is suggested to have different element types of summon in your party to compensate for your weaknesses since encountering mixed type element enemies is unavoidable. A balanced party consists of a tank type, a nuker type that deals area of effect spells or a high damage rate summon, a healer or a buffer who will cast healing or status ailments to whittle down your enemies’ HP. Also, you need to keep track of party’s total power. Some stages and features require a minimum total power for you to be able to unlock it, so be sure to check out which hero/ summon have decent power points. This feature allows you handle more high ranking heroes and summons. It also increases your stamina cap limit so you can play longer. 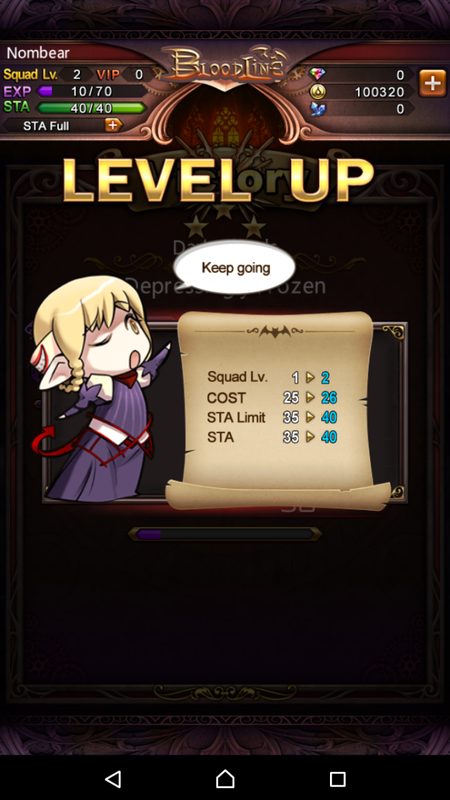 Leveling up your squad level is the easiest thing to do in this game since you gain exp as you progress, grind or farm for materials. Like most RPGs that involves elements, it also has the same rock-paper-scissors dynamic where certain element types can deal more or less damage to another element type. When grinding or farming, take extra note of the monster’s element type and compose your party based on which will deal more damage. This lets you take less time to clear a single stage. Time and stamina is important in this game so don’t bother grinding and farming on stages that would take you 3 to 4 mins to complete. Gold is easy in this game as long as you keep track of your daily quest and long term achievements. Keep an eye on the task that can be done along the way for this will make things much easier on your end. Keep progressing the story to unlock more areas, expanding your farming spots for better loot and exp. When dealing with boss battles, it is unavoidable that different kinds of elements will be involved, making it harder to balance your party’s element advantage. Just take out first the boss using a summon or hero who has an elemental advantage against it, if the minions are dealing more damage and killing your summon or hero fast, take priority turns and try to eliminate which enemy can deplete your summon/hero’s hitpoint faster. The spot where you test out your party against another player’s party and see how competitive your heroes have become. Pay extra attention on your party’s total power and compare it with your opponent before proceeding. Also, always check on “Bonus of the Day” and see which heroes will benefit from that buff so you can have the upper hand against your chosen opponent. Rewards are really worth it at the end of the line. Gold, Materials and Hero fragments can be acquired at random. A great place to farm Heroes that can be used for fusion, evolution and completing collection achievements. This place also has the highest rate of Magic Dust drop among all stages. When grinding in Challenge, make sure you have the right elements in your party for some of the enemies here are pretty tough and might give you a hard time. So that’s it for our beginner’s guide to Bloodline: The Last Royal Vampire! If you’ve got any extra tips you want to share, shoot us an email at asknombear@gmail.com. Saying Sephbot likes games is like saying the sun is a burning ball of pure, fiery hatred. It is known. His favorite game is Diablo 3, and basically anything coming from Blizzard.